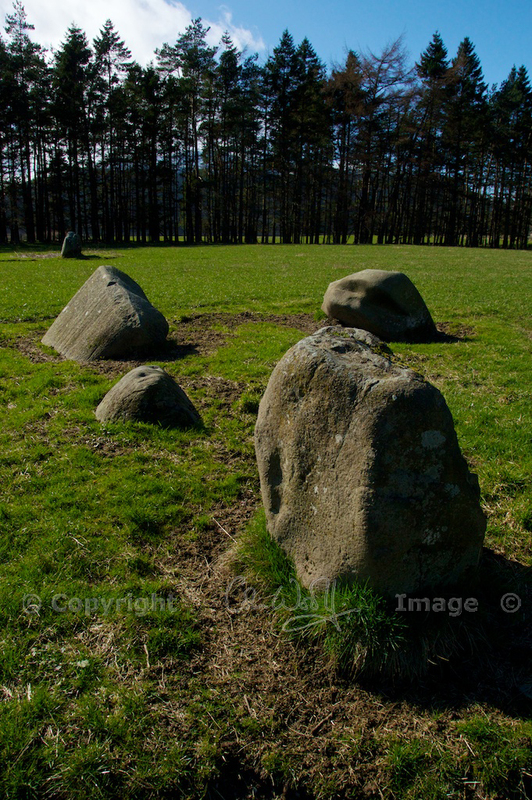 At Fortingall in Perthshire, in a field that leads down to the River Lyon, are a number of large stones. At first glance, they appear to be scattered at random as if by some giant hand, but it soon becomes clear that they are arranged in three groups. If you’re the kind of person who loves standing stones (or even sitting ones), you just have to go and inspect them. These massive boulders are rounded and smooth – historians describe them as ‘water-worn’, and when you get close and run your hands over them there is no doubt about it. They are nothing like the angular stones of Callanish or the squared blocks of Stonehenge; it looks as if they have been sculpted by nature. But as for any sense of their original positioning or alignment, you are completely lost. In Burl’s description, ‘RSC’ stands for ‘Recumbent Stone Circle’, and he is referring to the third, most southerly, group of stones (shown below). As the name suggests, recumbent stone circles contain at least one very large stone which has been deliberately laid on the ground, often flanked by smaller upright ‘posts’. You immediately wonder what they were used for. But in any case, archaeologists now argue that this third grouping was originally another ‘Four-Poster’. From the excavation of one group of stones, Burl tells us that “Flecks of charcoal and cremated bone were recovered.” Canmore, the database of the RCAHMS, reveals that a small sample of bone was dated to around 1110-900 BC. This does not necessarily indicate when the stones were erected – it merely proves that someone was buried here at that date. The rest is pure speculation. It seems that, in the 19th century, superstition led local people to topple some (but not all) of the stones into pits that they had dug ready for them. In each ‘circle’ of four stones, three were left in place. How do archaeologists know this? Because a beer bottle of that era was found buried underneath one of the fallen stones. Interestingly, the hole had been backfilled with small stones “such as might come from a central cairn”. But there are other possibilities. Many Victorian landowners got very excited about the prospect of doing some excavation, and it’s quite likely that an amateur historian had a dig around, maybe disturbing some of the stones in the process. Or perhaps the local farmer tried to shift them out of the way of his plough, and, in keeping with many of the stories attached to standing stones, he was visited by a mysterious pestilence before his task was complete. One thing we know for sure about the Fortingall stones, and it rather boggles the mind: if they date from the Neolithic period, they were most likely erected in the lifetime of the yew tree which stands in the nearby churchyard. The Fortingall yew is reckoned to be 5,000 years old, meaning that it has been a silent witness to the long story of human settlement in this quiet little corner of Perthshire. Until we learn to unlock the memory of trees, these stones will continue to present a fascinating puzzle. It’s as if you wrote this just for me! I’m in the middle of re-reading The Great Wood by Jim Crumley & of course it is only another 5 or 6 weeks until we return for a holiday in Comrie. We are really looking forward to then. Haha, I’m so glad, Ash! 🙂 I enjoyed re-visiting it in my mind while writing about it. Thank you, Lynne! No, I haven’t been to Barra but I am sure I will be green with envy when I see your posts! Is that where you are now? I wouldn’t mind! I’m sure it’s all beautiful. I hope the weather is being kind to you, too. How interesting! I was just discussing the Fortingall Yew with someone, but I didn’t know about the stones. I must try to go back there. It is such a beautiful part of Scotland. You’re right, Christine, it is stunningly beautiful. Words can’t really describe it properly! Yes, the stones are definitely worth a visit and I also want to go back and see if the church at Fortingall is open – it was shut that day, but there are some interesting relics inside! How wonderful! A lovely place to have in your family’s history. I love your photos – the grass looks to have grown more around the stones (they really must make life difficult for the farmer!) I also see you photographed the ‘plague stone’, which is nearby – I must do a post about this sometime, too! Thank you so much for visiting! I didn’t even know these stones were there. Next time I’m in the area I must go and have a look at them, preferably on a sunny day when they’ll sparkle at me. What a fascinating and curious business. I know, Lorna, I only knew from looking at the map before we went! It’s fairly easy to overlook them as you’re driving past. I often wonder if stones such as these were chosen for their composition or their magnetic qualities. I remember that the Callanish stones had big crystals of quartz (I would imagine it was quartz). I really enjoyed this Jo – I don’t think we’re ever likely to know all the answers about these stone monuments – I have theory that experts, probably unwittingly reflect their own ideals and prejudices in their interpretations, but to be honest, unless as you say, we learn to talk to trees, our personal theories aren’t any better or worse than the experts. Call me a hippy, but I do think that sitting inside rings, touching the stones or just letting your mind wander over the area, can give you all sorts of feelings and sensations – I’m not sure I’d want to know definitively why they’re all where they are. This one seems particularly attractive, but then anything sparkly with crystals is going to appeal to this girlie. Haha, well said, Anny, and if that’s what makes a hippy then I’m one too, and I’ll be quite happy to sit inside a stone circle any day! The trouble is that with ‘evolution’ I think we’ve lost a lot of the wisdom that would have told us instinctively about stones like these. And we try to replace that wisdom with science, which can only supply part of the picture. Every day, it seems, there’s a new ‘revelation’ about Stonehenge, fuelling our passion for logic. As for the crystals, they are like tiny mirrors, reflecting the sun (or the moon). Surely that must have been as appealing and magical back then, as it is now! And if the compulsion to collect sparkly stones is still with us today, I’d like to think some of that memory is preserved in us, somehow! Jo, I think we all do the same when something glistens & I suspect our ancestors, whatever era we think of, would do exactly like us. We are all one big family really, past & present & I imagine that there is very little difference between us all. Okay, so the hair on my body might have been a bit longer then, but hey, the hair on my head was certainly longer when I was a teenager than it is now! I laughed out loud at the beer bottle being found beneath one of the stones! 🙂 Great story! Haha, I know! I thought so, too. I’m pretty sure the men who set up the stones in the first place would have liked a pint or two afterwards! Not sure if comments are still relevant here, but I wanted to share something that may be of interest. 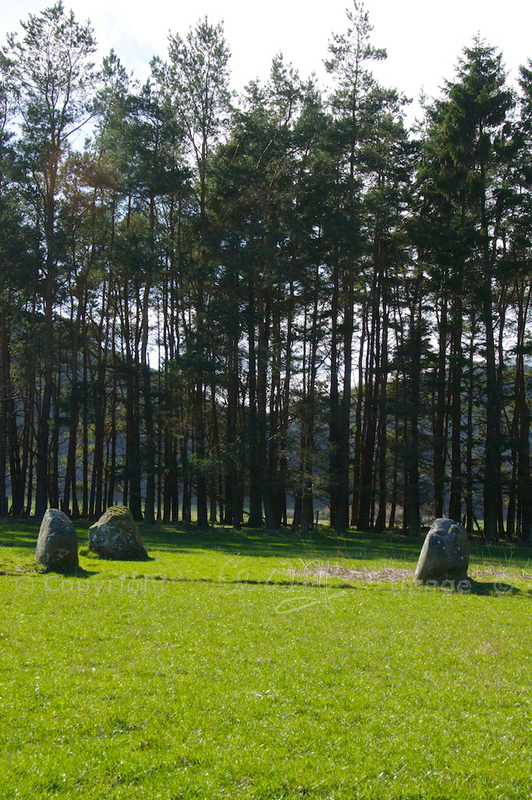 There is a stone circle in Killin … not far from these stones … that I’ve visited several times since 2013. I am a dowser, and during my last trip, in August of 2016, I took my rods. I had learned about ley lines (electro-magnetic fields) often found in stone circle configurations. Sure enough, I discovered a line radiating from the center stones … one line to each outer circle stone. There also appeared to be another one encircling the entire circle … very close to the outside of the stones. I’m not sure if perhaps someone more scientific than I might be able to at least lay out the ley lines pattern around these stones … perhaps it could be a clue to the original configuration. Much ancient knowledge has been lost, so it is unclear how the ancients tapped into magnetic fields, but at the very least it makes for an interesting days outing. That’s very interesting, and thank you for describing your findings. I didn’t know that there was a stone circle in Killin, and will have to seek it out. I did some dowsing a couple of years ago, at a local Neolithic henge monument (Cairnpapple Hill), which was fascinating. I agree that much ancient wisdom has been lost, and with it the original purpose for siting these stones. That doesn’t stop us being drawn to them – they still have their magic! There is certainly a very powerful energy ley running through this site, From memory it starts at the volcanic island of Staffa, passes through the Praying Hands of Mary, then the Cailleach (faery house) to the Fortingall stones and on to the large stone circle at Croftmoraig. My book “Ley Lines and Earth Energies” gives more information. How very interesting! Thank you, David. I’ve visited Croft Moraig but not (yet) visited the Praying Hands or the Cailleach. I will see if I can find a copy of your book! I did a dowsing course with Grahame Gardner a while ago and it was fascinating.